I've travelled to Rwanda twice in the past two years and the events of April 1994 are obviously inescapable. People who I now count as my friends survived the Genocide and so I have become not just well-informed about the Genocide, but also quite protective over how the story is treated by the West. The Genocide started two days after my 10th birthday, although, being born and raised in the UK, I didn't know anything about it at the time except a few new reports showing long lines of people leaving a city. It was with some scepticism that I approached A Sunday at the Pool in Kigali (2003), especially having read an extract from the first chapter that made excessive references to ‘asses’. My initial worry was that this would be another westernised narrative that unduly sexualised the suffering of people of colour. I put this to one side and tried to read on. 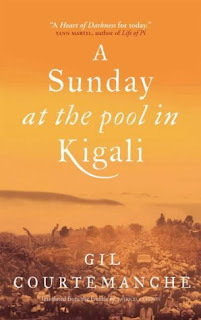 It is not long into the novel that you realise that Gil Courtemanche is in fact not just another westerner debasing Africa. Also you find that he is not just another westerner “consuming the ‘other'" or trying to extrapolate the West’s guilt for doing nothing to stop the massacres. The storyline, following the love between Canadian journalist Bernard Valcourt and a bargirl Gentille, gives warmth to the heart, then devastates the heart, before leaving the reader numb. Without giving too much away, this is a powerful read and deserving of the attention of anyone who cares, provided they remember that there are Valcourts and Gentilles in the world today who are still being ignored by the West.